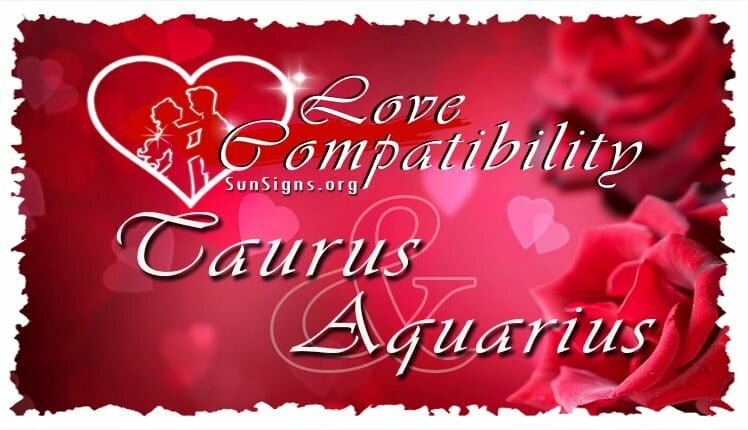 What exactly is the Taurus and Aquarius love compatibility? Is it a match made in heaven? Is it a relationship of contentment? Or a relationship of constant turmoil? Taurus’ are known for their rational and practical outlook on life. Aquarius is known for their giving and kind personality. When the Taurus Aquarius soul mates two come together it can lead to something magical and harmonious or it can be absolute chaos and growing problems. If you are a Bull who is interested in dating an Aquarius or vice versa, here is just how good or bad the Taurus and Aquarius compatibility is. The Taurus personality traits show they like the comfort of security and establishing a foundation. They pride themselves on creating a safe and loving home for themselves and their loved ones. The Water Bearer also values security with their need to feel protected and to protect those that they love. They both would place the hearth and home above the waywardness of a nomadic lifestyle. Taurus and Aquarius in love are believers in setting down roots so that they can begin to start a family together. The Aquarius person has a kind and friendly demeanor. They always try to brighten up a person’s day by giving them an encouraging word or listening to their problems. They are great at giving advice from a positive and motivational point of view. They provide advice that can help to set a person on a clear path. In the Taurus Aquarius relationship, the Taurean can be insecure and when paired with an Aquarian is able to move past their fears with the kindness that their partner provides. Aquarius is able to cheer up a moody Taurus who has had a bad day at work or tough time trying to accomplish a goal. The Aquarius lover makes sure to push their loved ones in the right direction but with words of love. Aquarius are humanitarians; they love to help their fellow men in whatever way that they can. They are the first to participate in charities and volunteer programs without a moment’s hesitation. They are quick to make a project to help out a friend or loved one in need and would not stop till the person is happy. Taurus’ are also givers who like to provide help to those in need selflessly. Taurus and Aquarius compatibility benefits from a mutual giving relationship where they are both viewed as priorities above all else. They are always available and around to take care of one another. Taurus’ are very loyal individuals. They never complain or talk badly about a friend or loved one. They value their friendships and relationships and do everything in their power to retain them. They are protective of their loved ones due to their loyalty and would not let anyone hurt their significant other. Aquarius also shares this zodiac trait. They are usually the most popular amongst their friends due to their loyalty and are always the one that people go to for help. The Taurus and Aquarius friendship creates a strong bond due to their loyal personalities and only help to strengthen their relationship. The Taurus Aquarius in bed both have a strong sexual chemistry. They are both givers by nature and would be open to completely please each other. They love intimacy and constantly display it whenever they have the opportunity to do so. They are not afraid to display their feelings for one another even in a public space. They value a satisfied and pleasurable relationship where each is happy. (Read about Aquarius Sexuality). With all of these great things that can occur from a Taurus and Aquarius love compatibility, there are also some bad things that can cause this relationship to fall apart. First, Aquarius is unpredictable and surprising. They say that they are going to do one thing but instead do the complete opposite. They do not like to be bored and may act out by doing something drastic such as taking a trip somewhere in the middle of the week without letting their significant other know. The Aquarius zodiac like the idea of an adventure and are quick to leap into it without any regard for anyone. Taurus who is practical and sensible by nature would not do well with an unpredictable Aquarian. They like to know that they are not going to come home to an empty house because their Aquarius lover has decided to go to Spain for a month. Many fights can come up due to this unexpected behavior. In the Taurus Aquarius love compatibility, the Taurean is stubborn and may find it difficult to compromise. They believe that they are always right and when they do not want to do something they do not do it no matter what it may be. They may fight and resist against a significant other who wants to do something as simple as go for a walk. Aquarius is kind and loving but when dealing with a stubborn Taurus they hastily retreat and make sure not to be around them. They state what they want and if their lover does not accept they go away to do their own thing. This can cause a problem for the Aquarius and Taurus compatibility. And then the Taurus expects to continuously be stubborn but is left confused when Aquarius walks away. In a Taurus Aquarius marriage, the Aquarius can come off as being detached or aloof. They value their independence and doing what they love and do not like to sacrifice that for anyone. They enjoy living on the spur of the moment and grabbing a hold of every opportunity for something new. Taurus men and women who like things a certain way, are more conservative in nature can find it frustrating dealing with a person who always seems to be out of reach. Taurus would seek to become closer to their lover whereas Aquarius would always be searching for that next fun and memorable thing to do. Aquarius inability to live in the present and its regularity can create problems in a Taurus Aquarius love compatibility. Aquarius men and women are known for diving into things with all of their energy and will. If they decide that they want to change something about their partner that they do not like they will do so no matter how long it may take. This can lead to years of plotting and manipulating in order to get their partner to be what they want them to be. Taurus who is easy going by nature cannot function or deal with a person who is too energetic or high minded. They will resist and rebel against the controlling behavior of an Aquarius and would make sure to not change for them. This behavior from an Aquarius only causes to hurt and eventually destroy the Taurus Aquarius compatibility. In conclusion, there are quite a few similarities and personality traits which can make for a rewarding and charitable relationship in the Taurus and Aquarius love compatibility. Their ability to be loyal to each other as well as their giving nature helps to foster the relationship. However their differences due to their need to be stubborn and unbending over simple issues can hurt their relationship. But if they both choose to work on compromising and understanding they will see the Taurus Aquarius compatibility really soar.